Cats are very smart, but they are also more impulsive than dogs and have limited patience. Thus, it’s more difficult to measure how just intelligent they are. Dogs cooperate and show off their skills on command. Cats, not so much. That doesn’t mean they’re dumb; cats have a brain structure that is 90 percent similar to the human brain structure. 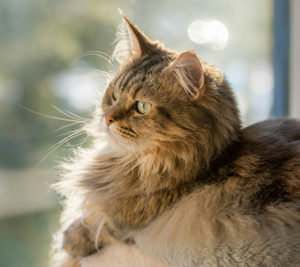 A cat’s cerebral cortex has almost twice as many neurons than a dog’s, and this is the part of the brain responsible for problem solving and rational decision making. The cerebral cortex also interprets input from the senses, plans actions, interprets communication, and is responsible for memory. Cats are also believed to have longer-lasting memories than dogs and can remember things that happened ten years earlier. The cat’s meow is an interesting feature. Cats rarely meow at each other – they use the meow to communicate with humans. And, cats domesticated themselves. It usually goes the other way around – humans found a use for a type of animal and domesticated them. Cats saw a use in humans and decided to live with us.